This guitar lesson will help you get some ideas on how to create interesting phrases using basic minor guitar arpeggio shapes. The phrasing ideas here are based around two main arpeggio patterns. 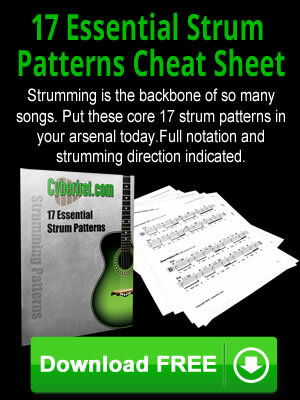 The first pattern is based on the open A minor chord form with the root on the fifth string. These two basic minor guitar arpeggio shapes are commonly used in rock and neoclassical style guitar soloing phrases. While they both sound cool on their own, they can sound somewhat stale and repetitive if we just play them going up and then back down the arpeggio shape. Let’s look at a couple different ways we can make them sound more interesting by combining the two shapes into a single phrase and then look at a way to vary the note pattern within them. The hammer on/pull off combined with the index finger slide gives the phrase some variety and makes it sound kind of slippery. We have played the ascending part of the phrase with the first shape and the descending part with the second shape. We also added the F note at the fifth string 8th fret and end on the E at the 7th fret on the fifth string. It sounds cool and gives the two connected arpeggio shapes some variety in their sound. This run sounds very good over an A minor chord. It also sounds good over an F major chord—try it and see what you think. These are just a couple of examples of ways to take basic arpeggio shapes and turn them into something that sounds more musical and expressive than just sweeping up and down the arpeggio shape. As always, take it slow and make sure you are playing everything clean before you speed it up. Using these types of ideas, look for ways to incorporate new patterns into other arpeggio shapes you use. You don’t always have to learn lots of different arpeggio and scale shapes, just look for ways to get more variety out of the ones you already know. The possibilities are almost limitless.